Galaxy S6 edge versus iPhone 6: vote for the better smartphone! What a time to be alive, friends! Last year, Apple blessed us with the best iPhone ever. And this year Samsung launched its most innovative smartphone yet, the Galaxy S6 edge. But which is better? We've already said many things about each, so we figured we'd take a step back and let you, our distinguished readership, have your say. We'll sit down with the GS6 edge and the iPhone 6, examine their features and performance in the most important aspects, and ask you to vote for your favorite. Have your way, boys and girls! The Galaxy S6 edge is a seriously attractive smartphone, but we don't really think its eye-catching game boils down to its curved display. In fact, we consider the dual-edge screen merely as the icing of the cake, finishing off the original Galaxy S6's elegant appearance with modern flowing contours. Moving onto the materials, lucky owners of the Galaxy S6 edge won't be holding creaky plastic in their hands, but rather a decidedly premium blend of metal and glass. Of course, Apple's crown jewel still looks great next to it with that polished anodized aluminum build, the smooth laminated display, and the shiny Apple on the back. Come on, the iPhone 6 is the best the iPhone ever looked! Everything about it has been rigorously thought out, even those plastic strips on the back somehow fit in the picture. However, the S6 edge has a literal edge in durability. Covered in tough Gorilla Glass 4, the smartphone is strong enough to withstand the torment of daily use, but is free of unnecessary bulk. It also comes in a bunch of lively colors, with the Emeral Green striking us as particularly "you'll never have it on an iPhone"! Apple still relies on a mature, reserved color palette comprised of gray, silver, and champagne gold. The question now is how well will each smartphone sit in your palm? Well, dimensions-wise, the Galaxy S6 edge measures 5.59 x 2.76 x 0.28 inches (142.1 x 70.1 x 7 mm), which means it won't sit in there much worse than the iPhone 6 does, although it is a considerably bigger device - the iPhone measures 5.44 x 2.64 x 0.27 inches (138.1 x 67 x 6.9 mm), which undeniably results in better portability. Check out the design shots below, and vote for the smartphone you think looks better. Which one has the better design? 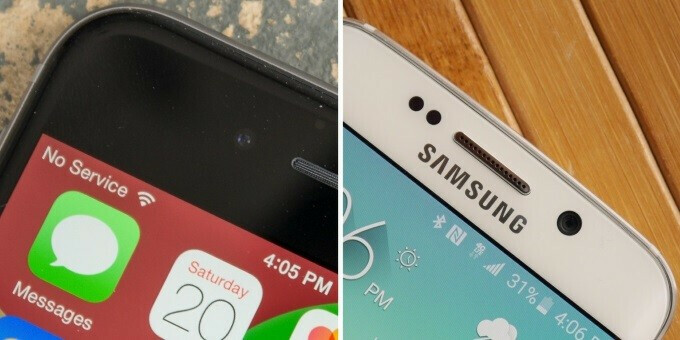 The Samsung Galaxy S6 edge and iPhone 6 feature completely different displays. The S6 edge comes with a Quad-HD (1440x2560) resolution AMOLED display which packs a whopping 3,686,400 pixels on a panel measuring 5.1 inches by diagonal! This results in a mind-boggling pixel density of 576 pixels per inch. Meanwhile, the iPhone 6 only has a 4.7-inch IPS LCD screen with a resolution - 750x1334 - that seems laughably low in comparison. And its pixel density is "only" 326 PPI. Does that really matter? We respect your opinion, but when it comes to high-end mobile displays, we consider color reproduction, image quality, and brightness levels as more relevant than the number of pixels per inch. Comparing the S6 edge and iPhone 6 in our display benchmarks, it appears both exhibit similar high quality in brightness levels, gamma, and Delta E characteristics. But the S6 edge boasts more accurate colors and less image quality distortion when viewed at a 45 degree angle. It is, hands down, the superior display. Check out the display measurements below, and vote for the display you think looks better. Comparing TouchWiz-skinned Android and Apple's iOS is, for the most part, pointless. They are two of the most popular operating systems in existence! You know full well what to expect from them, although we have to note that Samsung has continued its effort to tighten up TouchWiz. The company gets its customers' needs for simple, efficient usage patterns much better than before, presenting a refined, clean interface with way fewer menus, submenus, gestures, toggles, and confusion to handle. iPhone users have long been enjoying simple, practical functionality, even if iOS is still very bare in customization options and gesture control. Of important note is that both smartphones feature high quality fingerprint sensors that serve to implement extended security measures and proprietary payment systems. In addition, the Galaxy S6 edge features a heart-rate sensor, which is able to measure your pulse or double as a shortcut for camera-related functions. Check out the interface comparison below, and vote for the user experience that appeals more to you. Which one has the better user interface? The Samsung Galaxy S6 edge comes with a respectable 16MP unit on the back, while the front cam is a pretty adequate 5 megapixels. This camera boasts Auto Real-Time HDR, Smart Optical Image Stabilization, and IR Detect White Balance features for advanced light sensitivity. In addition, it's got a brand-new 'Quick Launch' gesture which lets users simply double-press the home button and launch the camera app in 0.7 seconds (yes, Samsung measured it). The iPhone 6, meanwhile, packs just an 8-megapixel main camera and a 1.2-megapixel FaceTime front camera. Megapixels aren't all that make or break a digital camera, though. The iPhone 6's camera - which is one the world's most popular cameras, by the way - is tuned to take remarkably sweet photos that nail the right balance between natural and artificially-sweetened colors. It also fares pretty good in the low-light shooting department, and takes pictures very quickly. In other words, it gives you everything you want from a point-and-shoot cam. But if you want larger photos and 4K video shooting, you'll have to pick up the Galaxy S6 edge. And its camera is the best you can have on a smartphone right now. The 16MP Sony sensor captures lots of detail and is capable of producing remarkably clean, crisp photos - especially in great lighting conditions. In poor lighting, the results are still decent, although they definitely aren't on the same level. But iPhones and Galaxy smartphones get better in that department each year, so Apple and Samsung will work it out eventually. Check out the camera samples below, make up your mind, and vote for the cam you think its better! Which one has the better camera? Well, there you have it! Vote away and voice your opinion in the comments. Would never buy either of them. can i ask why? and what is your current phone? says on his profile. a windows phone. Apart from user interface, the edge is the clear winner. But won't switch from my beautiful Xperia Z2 for either of these. Agree. Both have worse battery than my Z2, I'll wait till the Note 6. But if I was looking for a new phone it would be the Edge. Worst thing about samsung is its paid voters and commenters on these websites. Before them, these websites were really informative, then blind fanboys like apple's came, and then samsung brought every thing to another level of propaganda. To me SAMSUNG is equal to cheating. M8 for windows. Neither run windows phone. Never would buy an overpriced iphone. Samsung went style over funtion. No SD card on either. If i want a glass back with metal sides, I would get a Z3 with more things, like SD card. Dude, it's his opinion and his choice to prefer windows os. You shouldn't bash him like this. Yep, apparently I'm a troll because I don't like these two phones. Whatever. "Feature they don't use." Right. I mean, who even thinks about using their phone's camera? Or, who bothers to look at their phone's screen? No your a troll because you are commenting on an article about 2 phones you don't like when you could have just skipped the article. This is like walking into an ice cream parlor and telling all the cashiers you aren't buying ice cream because you dont like it, and then leaving. You don't seem to know what trolling is. If I said (just an example, disregard it) anyone who would buy these two pieces of crap are retards, that would be trolling (again, I don't believe this, they are good phones, just not for me) but I just said my opinion. Not trolling. People use that term very generously now, and its meaning has become watered down. I don't think he was trolling. He was saying that he didn't want to buy the phones mentioned in the article. The other geezer asked him what phone he uses so he said wp. How is this trolling? I don't like WP phone. Out of a staff strength of 100+ only one is on Window Phone. And everyone will make funny joke about him behind his back. For an IT department. If anyone ask us about Windows Phone and how is it we will laugh at them. LOL! I am not trolling too! Sigh. You make fun of a guy because he doesn't like what you do? You are just an unaccepting person. That is all you are . You don't like that. That's tough. Besides this post is about S6 vs iPhone. Its has nothing to do with WP phone. WP has been a running joke because many people see wp fans as weirdo. What you did in this posting just enforce that thought. Microsoft has a dark history and their recent partnership with Nokia has prove that Microsoft cannot be trusted at any level. I didn't even say anything about windows phone till angel asked me what phone I had. As I said below, even if I were to switch to something else, these are at the bottom. I'd rather get the Z3. And fine, see me as a weirdo because I don't like what you like. Trust me, if I cared a drop of what people think, I wouldn't listen to vocaloid, only watch anime and I wouldn't have one of the most niche consoles, the PS vita. Because I can live my life without other dictating it with peer pressure. I like what I like. Even if I were to switch away from windows, these are the bottom of the list. Z3, M9, or maybe even LG are higher. Just don't like these. Hahahaha ! A windows phone troll ! Windows Phone : the ugliest system ever seen !